Thickness: 12mm.Hole size 22 x 22mm. Maintaining the cleanliness of flooring is important, if dirt, water and/or debris soil floors it can create slip hazards. Our medium duty outdoor entrance matting helps to rid shoes and other footwear of dirt and moisture to keep floors cleaner and safer. They are extremely hard-wearing, flexible vinyl mats which provide excellent drainage for water and dirt to stop it from getting inside your premises. The ribbed surface offers a great way to remove dirt from footwear and provides great slip resistance for safety. Another safety feature is the tapered edges which help users avoid tripping and it allows easy wheeled access. 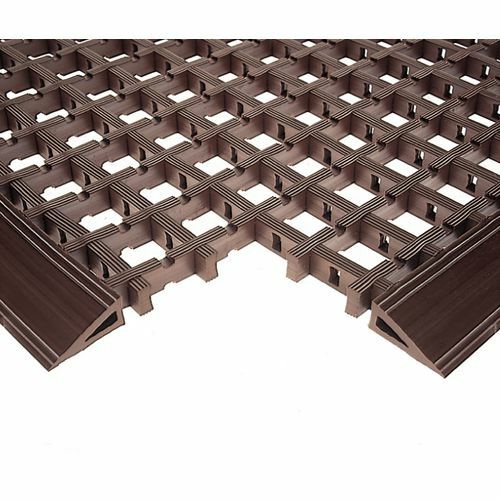 This matting is also suitable for use indoors as they are flame retardant to DIN 4102. They are available in three colours; black, brown or grey and there are three sizes to choose from - W x L mm; 600 x 1200, 1000 x 1500 or 1200 x 1800. 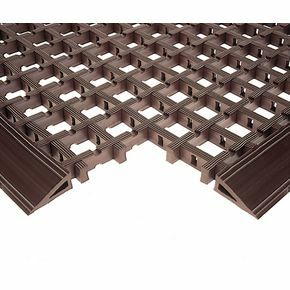 Our medium duty outdoor entrance matting provides great dirt and water drainage to prevent it from entering your premises. They come with a 12 month guarantee and FREE UK Delivery.